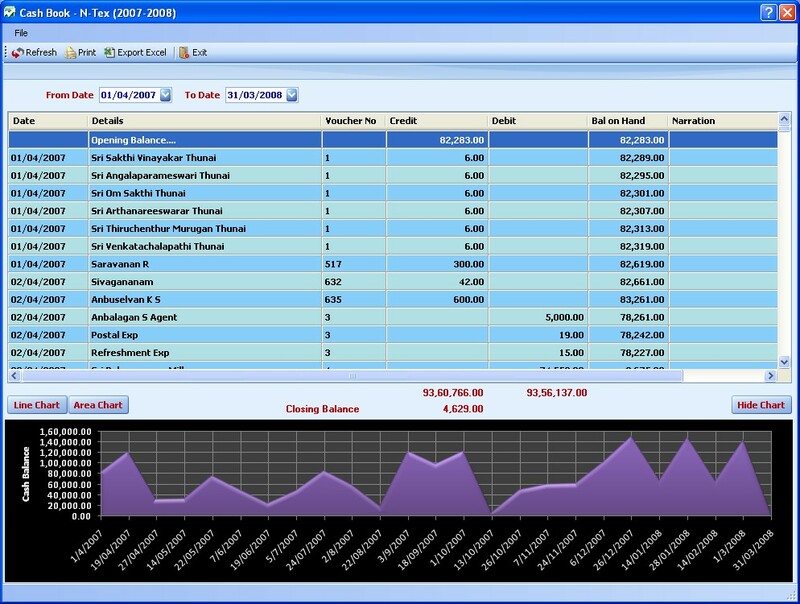 This is an accounts software with Inventory management and has rich set of features. Data entry is easy and there is no need for accounts knowledge to be able to use the package. Features: The user interface is easy to use. Even complete beginners can get productive very quickly. It is able to manage its functions through several modules that are named company, Suppliers, Customers, Accounts, Payroll, Job Work, Utilities, Accounts Reports and Inventory Reports. 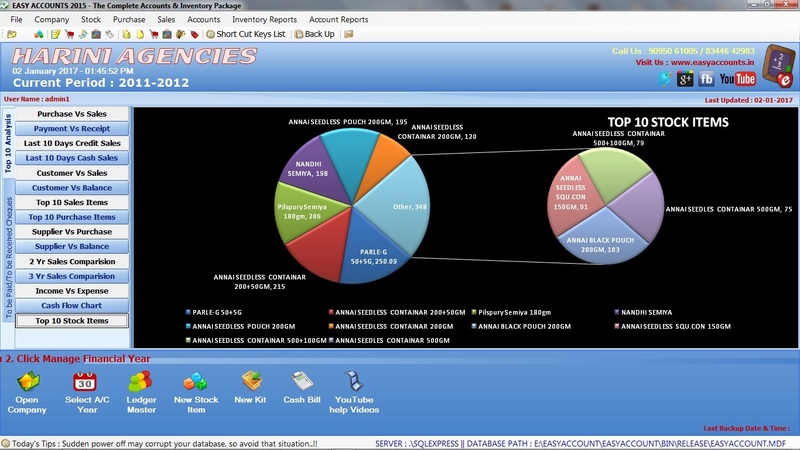 Some of the company wide features supported include creation of unlimited number of companies, all the interactive screen are controlled by user rights, so that only appropriate accesses take place.Year end processes are done automatically without interrupting normal processing of the businesses.Data can be exported in Excel mode from all the operating modules.Stock maintenance features include unlimited items that can be created. All product and/or services prices can be changed at one place.You get low stock alert as the application powers up.Kit master preparation, kit production maintenance, daily stock usage entry etc are maintained. Employee wages report keyed to their production rate are made available. In the inventory functions, purchase order mechanisms are included. All the applicable taxes are managed. 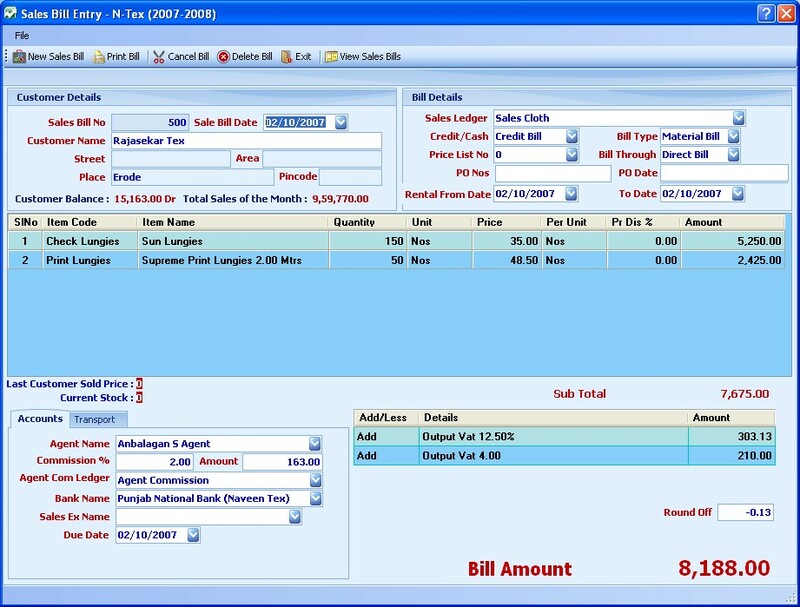 Payments are also tracked.Statements related to suppliers and their outstanding bill amounts are available.It manages customer related functions easily. These include customer name, contact details, sales bills, agency commission and taxes applicable, bills printing, monthly statements of all sales to a customer etc are available.All the account functions are taken care of that include the general l;edger and any number of other ledgers. Accounts management and year end account book preparations are handled too.Payroll preparation, job work and various return preparations are included in the package. Overall: It is a nice and handy utility for accounts and inventory management. takes care of customer related functions as well as payroll etc.